Tattered Musings: Fig. 53 Handbuch Der Schiffchenspitze, band 2. Yesterday (24 Nov 2008) I finished another of the figures related to fig. 51 in Tina Frauberger’s Handbuch Der Schiffchenspitze, band 2. Like fig. 52, fig. 53 encloses fig. 51. I am for the most part pleased with my work. My tension is still inconsistent but my bridge and split ring are better than in fig. 52. I used a lock stitch at the end of the chain leading to the last ring and at the end of the bridge I brought the last stitch out the bottom of the chain. This results in the threads exiting in the direction of the split ring. In fig. 52 I did a normal chain and bridge and just brought the thread up towards the split ring. This resulted in some amount of twist and distortion. The one experiment / questionable practice came at the start of the chain after the split ring. I did not like the looks and I had forgotten my Magic Thread. I did a little retro-tatting and produced an acceptable chain. I few chains later I realized that I had again forgotten my Magic Thread. My original intent was to just sew-in the one thread. In the end I decided to try putting two Magic Threads in a single chain. The technique works but produces a really fat and mis-shaped chain. You can see the bridge, split ring and fat chain just to the right of 12 o’clock. Fig. 53 is nice but I mainly worked it up so I could compare it Mary Konior’s Small Cross on pages 88 and 89 of her Tatting with Visual Patterns. After studying Mary Konior’s cross I have found that with the exception of modifications to turn a six arm figure into a four armed figure the patterns match. Many of the knot counts are the same. I hope to start on the cross as early as tomorrow, well maybe after thanksgiving. I will explain the similarities and the differences in a later posting. It is nice to be tatting again. Now if I can just get my knots consistent and find a block of time to work on my bobbin lace lesson. Oh, I love this snowflake pattern! I've tatted it myself! It sure works up beautifully! You did a lovely job. Yes it is one of the prettiest snowflakes in tatting and it works up so perfect. 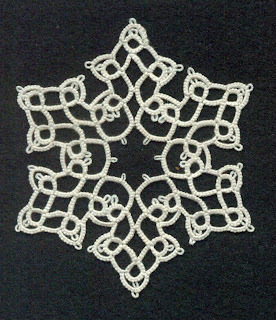 By the way, the German word Bogen is a chain in tatting just like the Danish word "bue".